Many successful people I know cheat. Or perhaps I should say they cheat routinely. Regularly. And most importantly, with limits. For many of these people, it’s the very act of cheating that keeps them successful. It keeps them sane. Open marriages? Off-shore bank accounts? Not-quite-medical-marijuana? No, no, no! Today, we’re talking about something far less controversial. We’re talking about pancakes or pepperoni pizza or whatever your little heart desires when you’re otherwise trying to be “good” with your food choices. 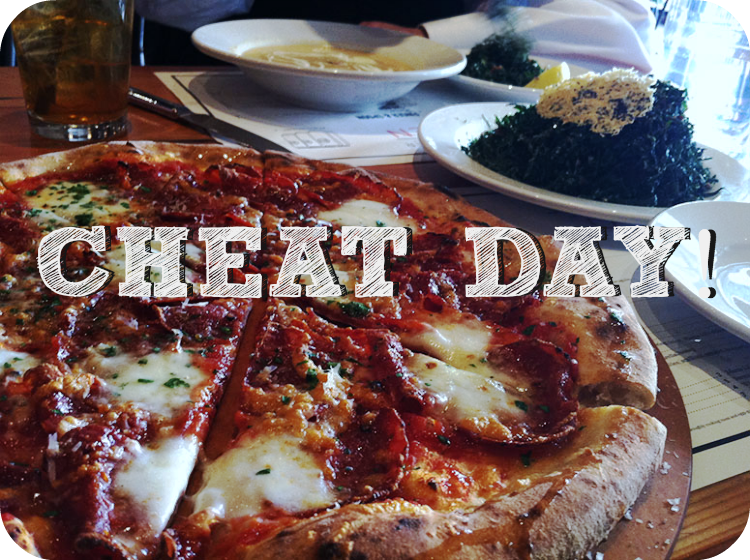 Today, we explore a go-to practice for many people who are successful in maintaining a healthy weight: Cheat Day. Sometimes referred to as splurge day — or, ” Dieters Gone Wild (DWG)” day by “Four Hour Workweek” and “Four Hour Body” author Tim Ferriss — this involves a day in which you cut yourself some slack to enjoy all of the “bad” foods you avoid the other six days of the week. My Cheat Day primarily involves Friday night dinner and Saturday night dinner, accompanied by wine or cocktails and maybe even dessert. Others I know enjoy a full-on splurge all day Saturday, or even all weekend long — and when Monday comes around, their weight remains stable. The Cheat Day approach works for a few reasons. One — psychologically, you won’t feel as deprived when making your day-to-day healthy choices because you know you’ll eventually have an opportunity to indulge. As anyone who has attempted to change their diet before knows, feeling deprived isn’t a good thing. The emotions generated from feeling deprived are very powerful, and can cause us to obsess about the foods we “can’t” have. Then, we start to feel sad and sorry for ourselves, and we resent the thin co-worker who, in spite of eating bacon at every meal and having birthed three children, has the flat, taut belly of a 17-year-old. Cheat Day gives us light at the end of the tunnel so that our feelings of deprivation are less likely to lead to spontaneous bingeing that leaves us feeling ashamed, defeated and guilty. Two — the very definition of Cheat Day means that you make a commitment to yourself to adhere to healthier food and lifestyle choices during the week. 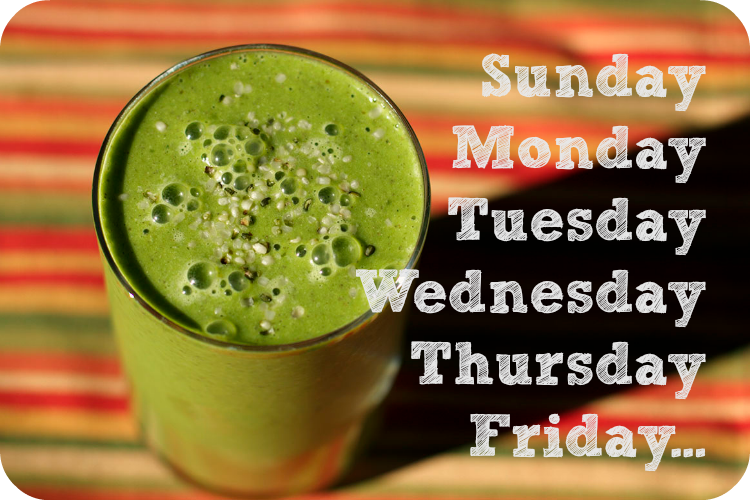 If you’re maintaining a healthy diet six days out of the week, 85% of your diet will be optimal, or pretty close to it. If you’re eating well 85% of the time — if 85% of your calories come from nutrient-dense, unrefined foods — just imagine what that will do for your body. Chances are you’ll not only maintain a healthy weight, but your immune system will strengthen, your skin will brighten, and you’ll recapture the energy of your 20s. Third — Cheat Day is fun! The reward is always sweeter when you’ve worked hard for it, isn’t it? My favorite Cheat Days are when I’ve been especially health conscious during the week. If I’ve been on my regular workout routine and have eaten lots of veggies and green smoothies throughout the week, I can fully enjoy, without guilt, the hamburger at Castagna Cafe, or Oven and Shaker’s spicy salami pizza and kale salad. With an ice-cold martini, of course. Ah, Cheat Day. It’s Wednesday, and I can already feel you drawing near. How about you? Do you have a Cheat Day? What are your favorite splurges? 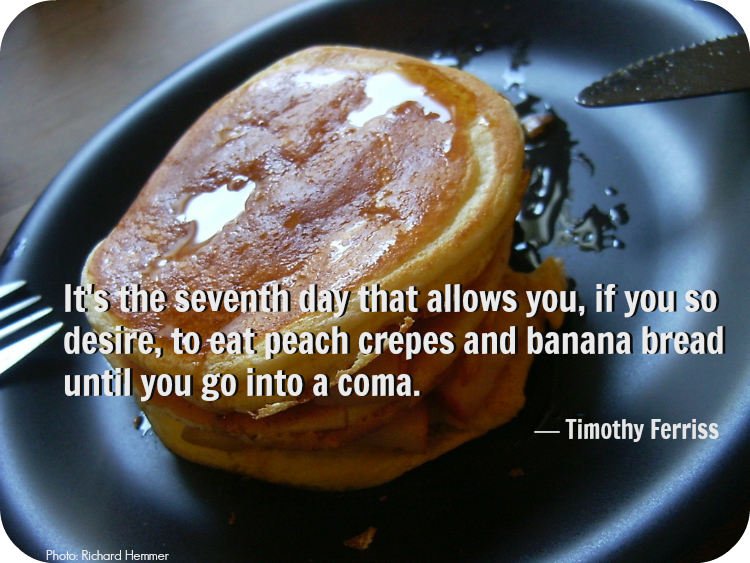 And what are you eating the other six days of the week? Please post a comment below — I’d love to hear from you! For more healthy recipes and lifestyle tips, sign up for my newsletter — it’s free!